From the Warp: Can anything replace the old Boltgun metal? Can anything replace the old Boltgun metal? When GW released all their new paints, I started looking around for a new line of paint after hearing the GW metallics weren't all that good. I recently decided to do a small comparison of a few metallic colors to see how each one compared to the old Boltgun Metal. I used to use the cheap stuff all the time. No problems with it at all. Sure, it wasn't the best and coverage was a little less than desirable, but I didn't know any different and it was cheap. It got the job done in the end. Then I found GW Boltgun Metal. I became a huge fan of it overnight. From the shade of it to the coverage and the consistency. It did everything I needed it to do. Then GW revamped their paints on me. Cries of, "It's not the same!" and " The new stuff stinks!" were all I was hearing from folks I knew. Enough that I decided to go looking around before buying some of the new stuff myself. Instead of picking up the new GW metallics, I opted to try something from the P3 paint line. I went with P3 Cold Steel. I'd used some of their golds before and I loved them. I figured the silvers would be just as nice right? And it worked just fine. I'm not a huge stickler for paint and I'll use just about anything really when it comes down to it. Then I decided to do this test to see just what the differences were. I'm not attached to any particular brand or company either. My loyalty lies with the paint that can provide me the best coverage and consistency overall. I decided to keep my very scientific experiment here limited to "silvers." There was no way I was going to try and compare all different kinds of metallic colors. The only silver I did not get my hands on was anything from Vallejo. I would have liked to, but I couldn't find anyone who had some I could borrow for this little test. I decided to use the old GW Boltgun Metal as the standard. All the other paints would be compared to it. I painted small swatches of each metal, made some notes on my initial impression and then put all of them into a chart that covered four aspects (coverage, thickness or body, watery and consistency). I chose these four aspects because they made sense to me. I know they are somewhat subjective, but I'm looking to replace my old Boltgun and want to mimic the qualities it had. I want a metal that covers as well as the old Boltgun did. Thickness or how much body a paint has is important too, too thick and you start obscuring details quickly. If a paint is so watery that you end up with streaks and such, it means more layers and work. The last aspect was consistency, with an appropriate amount of shaking before use, I wanted the metal to go on the model nice and smooth. I don't mind doing two passes to get the absolute best coverage, but I want to get the most from each pass. One pass over an area that has been primed correctly would be super nice, but I'll take what I can get. A metallic color got a green checkmark if it was as good or better than the old GW Boltgun Metal and a red X if it was not as good in terms of quality in a particular category. Simple as that. I had a much more complex system, but boiled it down this... either it's as good or not. After looking over the results, it looks like GW has been able to keep the consistency up with their new "Boltgun Metal." I'm going to be buying my own bottle of the new Leadbelcher metallic since I borrowed one for the test. The next best metallic I believe is the one from Army Painter. After that, you start sacrificing quality here and there. I didn't get into all the different shades of silver out there and there are tons of them available. Cool metals, warm metals and so on. If you're looking for a very specific color for your painting style, then the chart might not help much. You'll need to buy what matches your need. If you're looking for a basic metal color that you can use for tabletop quality, I'd say to try the new GW or Army Painter metallics. Those are the two I'm going to look through first. I've found Leadbelcher to be an almost exact match to Boltgun Metal also, I'm really pleased with it. More so because I had painted a whole batch of Necron warriors with Boltgun before the new paints were released and its hard to tell the difference between new and old (that includes the new washes) who knows, maybe my eyes need testing?! Interesting you say that the Army Painter metallics are good, I've been thinking of switiching over to Army Painter for everything once my current projects are finished. How do you do different types of silver? Eg armour and weapons. If you want to make them distinct do you start with the same base silver and wash/highlight differently or do you start with different silvers. I want to get a nice smooth brightish silver for armour plating and a duller darker look on bits of weaponry. Really nice to see such a reasoned and well explained comparison of the old and new colours after all the vitriol that seems to be floating about out there. Simply based on colour, from your image it seems that GW really have got almost the same colour for their new paint, and if as you say, the qualities of the paint are the equal of the old Boltgun then thankfully it shouldn't present too much of a shift. For the Vallejo paints, if you are interested, I've got their Boltgun equivalent, and although colour wise its pretty close, I find consistency wise the metallic particles are more course than Boltgun metal. In use, this means the coverage isn't as smooth as the GW equivalent, and it also causes it to separate much more easily if you try to thin the paint. Great in depth review as usual! Thanks. Funnily enough, replacing Boltgun Metal was the one question that never really bothered me a lot with the new colours, since I figured GW would always produce a serviceable metallic silver. Seems I was right ;-) Thanks for doing the comparison, though! I had to learn the hard way that some of those new colours are huge departures from my old favourites (Tin Bitz...). I don't take issue with the quality of the paints themselves, though: They are cool enough. My main concern is having to rethink tried and true recipes. Fortunately, most of the problems can be easily solved by using replacements from other ranges. I think the assessment of the Reaper Honed Steel is pretty spot on. Reaper metallics are "good, not great." I use them exclusively, and have yet to switch purely out of habit and muleheadedness. I tend to basecoat over a black primer coat with their Shadowed Steel. It's darker (the 'shade' in that paint triad), and covers a tad better than the Honed Steel. I thenk wash with Badab Black, and then apply my layer of Honed Steel. Trying to apply Honed right over black gets the results you ended up with. I do like the rest of Reaper's paints, but their metals are definitely the weakest in the line. Once I run out of my current cropof metals, I might have to jump over to Army Painter and give those a go. Excellent comparison! I've found the same thing. 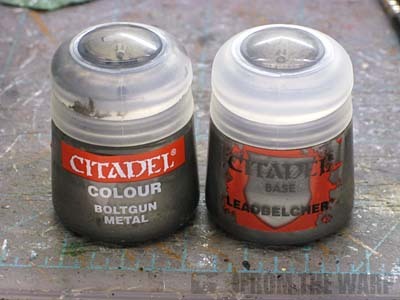 Though Leadbelcher looks a bit odd in the pot, it covers well and is very similar to Boltgun Metal. I also tried P3 Pig Iron (closer in color to Boltgun Metal than Cold Steel), and it was okay but not great. Thanks for the feedback guys. It's good to hear what others have discovered as well. rob82: I've got a post coming up on some of the metallic techniques I use. I just need to get all the pictures put together. Not sure why the new range from Citadel is getting such bad press. I've been playing around with it and really love how versatile it is. As with anything try it before you knock it. Every brand has some things they do really well and some things these do poorly. I've used some of P3s more watery metallics as a glaze in certain instances. I actually have been disappointed with Leadbelcher. It seems to separate much more than Boltgun Metal, and the metallic particles look much larger. (These two things may be related.) I feel it's a bit darker than Boltgun as well. I really like the P3s for color, though their metallics have always been sub standard in coverage compared to the GW stuff. Timely article, Ron - I'm down to my last two pots of Boltgun Metal and have thus far been disappointed with the Vallejo equivalent (it's much more 'blue'). I'll have to give Leadbelcher a go! Reaper Master Series paint equal for Boltgun is Shadowed Steel (9052) NOT Honed Steel. That is too shiny that is the one for Chainmail. As for the Vallejo go with the Game Color series NOT the Model Color series they are closer matches to the GW paints. Gunmetal Metal (054) wouldbe the one to try. You seemed to pick chainmail matches to try and get the same color as Boltgun and your going to be WAY off. I've recently been using Vallejo Model Air Gun Metal for all of my metal needs (both brush and airbrush). It goes on really smoothly (smoother than boltgun metal in my opinion). The coverage is good. It doesn't clump and it is really easy to get a smooth finish. I'd like to thank everyone who has tossed in their two cents on this one. It's nice to know others are going through the same things when it comes to finding a suitable metallic color to go with these days. For me, I'd say the quality of the paint is more important than the exact color. I can find a match or mix it if need be, but if I don't like the way a paint performs or it's a pain to use, that kills the painting experience for me. Ron, another great article. As I near the end of my Boltgun Metal, I've wondered where to go and how the new stuff stacks up. I had long heard that P3 was inferior to GW in terms of metallics, so that is nice to have confirmed rather than just going off potential fan hearsay. Good work by GW on keeping their metallics up to snuff. Marshal Wilhelm: I was a bit surprised at the GW consistency myself. I'd heard lots of things myself about the good and the bad with the new paint line and took what everyone else was saying at face value. The bigger surprise was how well Army painter performed in this little test. You don't hear too much about them unless it's about their spray primers, so it was nice to discover their metallic paint was up there in terms of quality. Anon; Thanks for stopping by! As someone already mentioned Pig Iron from P3 is pretty much the closest you can get to Boltgun Metal outside of GW. I actually prefer it over the old Boltgun Metal, not so thick. I use P3 Pig Iron for a number of things, but find that it is a bit "flatter" and a tad lighter than Boltgun. I like how it works, but am really glad that you did this comparison as Boltgun always seemed like the right tone and color for a base, unpainted metal. Thank you very much for all your work...and if companies want to know if your efforts are worthwhile, I have recently secured some of Army Painter's Strong and Dark tone because of your review. Many thanx for that as well. Kevin: Sounds like you've got a workable solution there. While lots of these paints are similar, it really does come down to personal preference in the end. If a P3 paint works for the way you like to paint and what you want to do with it, then by all means, go with it! I too found the P3 to be slightly thinner, I just like the super smooth coverage from Boltgun Metal and Leadbelcher. P3 is not quite the same for me. 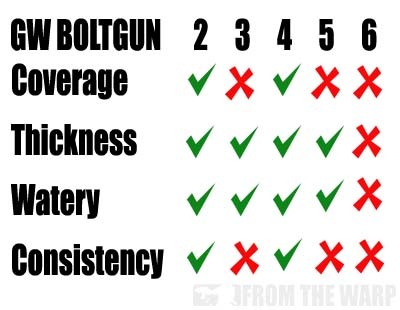 Honda: Boltgun metal does seem to be spot on doesn't it. It's one of those colors you can put on a model, add a wash or highlight and make it into any number of other things. And I'm glad the Army Painter inks worked out for you! I find it interesting that no-one has mentioned coat d'arms paints yet - were'nt they the original producers of gw paints? I'm waiting on an order coming in which will include their boltgun equivalent. does the consistency category account for particle size? one of the big differences I've seen in the various metallics is how easily (or not) you can see the particles of metal suspended in the paint. GW's bolt gun metal set the standard for me in terms of smoothness; you just can't see the particles. other metallics, even from the GW line, don't even come close. did this quality factor into your test results? SOS: Didn't get my hands on that line and it's not one you hear of often... or at least I don't. I tried to use the ones you hear of often. Grysh: Good question. I didn't really think about the particle size. If I were to categorize that, it would have gone into Consistency. That was more about the light and darkness of the metallic even once mixed normally. Particle size would fall into there.